Autumn pumpkins are for more than just carving into Halloween jack-o'-lanterns. You can use fresh pumpkin for cooking and baking. To prepare the pumpkin, bake it skin-side-down in a roasting pan and cut the pulp out after it's cool. You can store the fresh pumpkin in cubes, or puree it in a food processor first. Freezing or refrigerating the pumpkin are good ways to keep it fresh if you can't use it right away. Simply remove the pumpkin from storage when you're ready to make pies, breads or any other fall-inspired recipe. Allow fresh-baked pumpkin to cool down prior to storage. 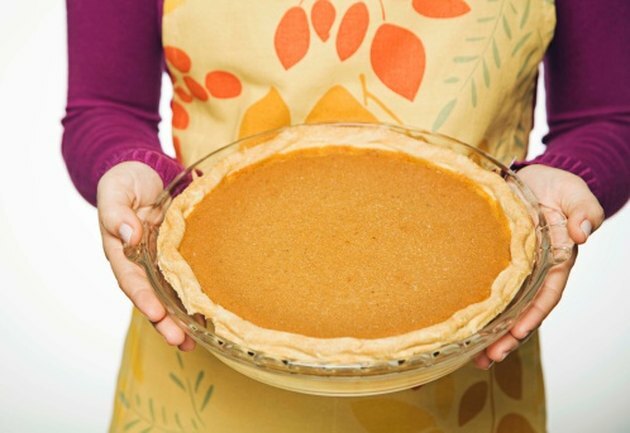 Freeze or refrigerate the pumpkin within two hours of baking it. Transfer the fresh pumpkin cubes or puree to rigid plastic storage containers or heavy-duty freezer bags featuring zipper-type seals. Press airtight lids onto the containers to create secure seals. Squeeze as much air as possible out of the plastic bags before sealing them. Write the storage dates on pieces of masking or freezer tape and attach them to the containers or bags. Store the fresh pumpkin in a refrigerator for three to five days. Store the pumpkin in a freezer set at 0 degrees Fahrenheit for 10 to 12 months for the best flavor.